Friday March 17, the day before the 54th running of the Sebring 12 Hours, will see the latest group of (mainly) well known names inducted into the Sebring Hall of Fame. Sadly, neither Briggs Cunningham or Bob Akin are still with us. 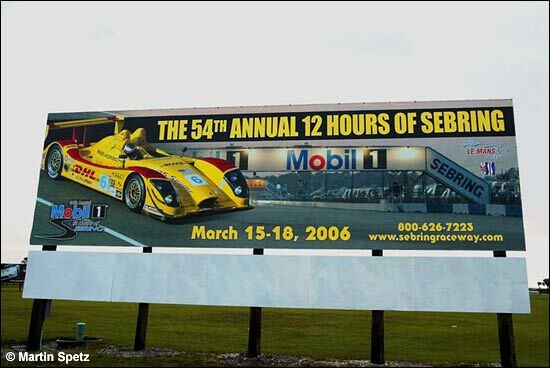 The Hall of Fame was established on Sebring’s 50th Anniversary in 2002 to honor drivers, manufacturers, promoters, officials and others who have contributed to the history of America’s oldest and most prestigious sports car race. Hall of Fame inductions are held every other year. Phill Hill, Briggs Cunningham, Bob Akin and Brian Redman are all former Sebring winners – Hill in 1958, 1959 and 1961, Cunningham as an entrant in 1953, 1954 and 1955, Brian Redman in 1975 and 1979 and Bob Akin in 1979 and 1986 (the fastest winning speed ever – with partners Hans Stuck and the late Jo Gartner). Dr. Don Panoz founded the American Le Mans Series, and has owned the circuit for the last nine years. Charlie Earwood has served as an official at Sebring for 39 consecutive years, including numerous times as Chief Steward. From 1987-89, Earwood was promoter of Sebring’s 12-hour classic. During this period, he supervised major changes to the raceway, including the establishment of Sebring’s successful winter testing program. Previous inductees include Dan Gurney, Jim Hall, Bob and Al Holbert, Mario Andretti, Juan Manuel Fangio, Carroll Shelby, John Fitch, Sir Stirling Moss, Bobby Rahal, IMSA Founder John Bishop, race official Ford Heacock and previous Sebring promoters Alec and Mary Ulmann, Charles Mendez and John Greenwood. Porsche and Ferrari have also been inducted into the Sebring Hall of Fame.